The Rhine–Meuse–Scheldt delta or Helinium is a river delta in the Netherlands formed by the confluence of the Rhine, the Meuse and the Scheldt rivers. The result is a multitude of islands, branches and branch names that may at first sight look bewildering, especially as a waterway that appears to be one continuous stream may change names as many as seven times, e.g. Rhine → Bijlands Kanaal → Pannerdens Kanaal → Nederrijn → Lek → Nieuwe Maas → Het Scheur → Nieuwe Waterweg (→ North Sea). Since the Rhine contributes most of the water, the shorter term Rhine Delta is commonly used. However, this name is also used for the river delta where the Rhine flows into Lake Constance, so it is clearer to call the larger one Rhine–Meuse delta, or even Rhine–Meuse–Scheldt delta, as the Scheldt ends in the same delta. By some calculations, the delta covers 25,347 km2 (9,787 sq mi), making it the largest in Europe. The economic importance of the Rhine–Meuse–Scheldt delta is enormous, since the three rivers are important navigable waterways. The delta is the entrance from the North Sea to the vast German and Central European hinterland (and to a lesser extent France). Major ports in the delta are Rotterdam, Antwerp (Belgium), Vlissingen, Amsterdam (through the Amsterdam–Rhine Canal), and Ghent (through the Ghent–Terneuzen Canal). The land areas in the delta are protected from flooding by the Dutch Delta Works. Satellite image of the Northern part of the Rhine–Meuse–Scheldt delta: 1. Part of the island of Goeree-Overflakkee 2. The island of Tiengemeten 3. The west end of the province of North Brabant 4. The island Voorne 5. The island of Putten 6. The island of Hoeksche Waard 7. The island of Dordrecht 8. The national park of De Biesbosch 9. The island of IJsselmonde 10. The island of Rozenburg 11. Part of the province of South Holland a. The Oude Maasje stream b. The Bergse Maas ship canal c. The Afgedamde Maas section of the Meuse d. River Waal e. River Boven Merwede f. The Nieuwe Merwede ship canal g. The Amer estuary h. The Hollands Diep strait i. River Dordtsche Kil j. River Beneden Merwede k. River Noord l. River Lek m. River Hollandse IJssel n. River Nieuwe Maas o. River Oude Maas p. River Spui q. River Bernisse r. The former strait of Botlek, now part of the Rotterdam sea port s. River Het Scheur t. The Nieuwe Waterweg ship canal u. The Brielse Meer (Lake Brielle, a former Rhine branch called Nieuwe Maas-Brielse Maas) v. The Haringvliet strait w. The Krammer strait x. Lake Grevelingen y. The North Sea. The shape of the Rhine delta is determined by two bifurcations: firstly, at Millingen aan de Rijn, the Rhine splits into the Waal and the Nederrijn, and secondly near Arnhem, the IJssel branches off from the Nederrijn. This creates three main flows, two of which change names rather often. 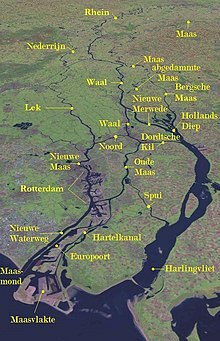 The largest and southern main branch begins as the Waal and continues as the Boven Merwede ("Upper Merwede"), the Beneden Merwede ("Lower Merwede"), the Noord River ("North River"), the Nieuwe Maas ("New Meuse"), Het Scheur ("the Rip") and the Nieuwe Waterweg ("New Waterway"). The middle flow begins as the Nederrijn, then changes into the Lek, then joins the Noord, thereby forming the Nieuwe Maas. The northern flow keeps the name IJssel until it flows into Lake IJsselmeer. Three more flows carry significant amounts of water: the Nieuwe Merwede ("New Merwede"), which branches off from the southern branch where it changes from the Boven to the Beneden Merwede; the Oude Maas ("Old Meuse"), which branches off from the southern branch where it changes from the Benede Merwede into the Noord, and the Dordtsche Kil, which branches off from the Oude Maas. Before the St. Elizabeth's flood (1421) the Meuse flowed just south of today's line Merwede–Oude Maas to the North Sea and formed an archipelago-like estuary with the Waal and the Lek. This system of numerous bays, estuary-like extended rivers, many islands and constant changes of the coastline, is hard to imagine today. From 1421 to 1904, the Meuse and the Waal merged further upstream at Gorinchem to form the Merwede. For flood protection reasons, the Meuse was separated from the Waal through a lock and diverted into a new outlet called the "Bergse Maas", then the Amer flowing into the former bay known as the Hollands Diep. The Rhine–Meuse Delta is a tidal delta, shaped not only by the sedimentation of the rivers, but also by tidal currents. This meant that high tide formed a serious risk because strong tidal currents could tear huge areas of land into the sea. Before the construction of the Delta Works, tidal influence was palpable up to Nijmegen, and even today, after the regulatory action of the Delta Works, the tide acts far inland. At the Waal, for example, the most landward tidal influence can be detected between Brakel and Zaltbommel. Already in the time of Julius Caesar, the "Island of the Batavi" was known to the Romans. Its eastern point was the split of the Rhine into the Oude Rijn and the Waal, which at this time were the two main branches of the Rhine. The Waal flowed into the Meuse in the Roman period. Pliny the Elder's Natural History gives a list of tribes living in the "Gaulish islands" within the delta region between different mouths of the Rhine. First he mentions the large island of the Batavians and the Cananefates. Then he gives the list of other peoples who he says are stretched out along 100 Roman miles, between the mouths Helinius and Flevus. The Helinius (or Helinium) is understood to be the main mouth of the Meuse, where the main water of the southern branch of the Rhine, the Waal (Latin Vacalis) also discharged. Flevus (or Flevum) was a Roman fortification on the Ocean, north of the more important Old Rhine, mentioned by Tacitus, and equated today with Velsen. Although the details are no longer clear, there was apparently sometimes an extension of the Old IJ that came close to the north sea here. But the term Flevo was also have used by Pomponius Mela to refer to the fresh water lakes which were in the area of the modern Zuiderzee, which Mela specifically says that the Rhine fed into. So the Rhine mouth mentioned by Pliny might have been a discharge into a lake, or perhaps water running to Flevum on the coast may have run via the lakes to the coast, perhaps first through an ancient version of the Vecht, or the IJssel. The IJssel however was joined to the Rhine artificially, by Drusus, and is quite far from any of the places known to be called Flevus. Suetonius says that this channel was still referred to as Drusus' fossa in his time. Some authors have argued that the mouth Pliny mentions is the Vlie, much further to the north than Velsen where the main waters of the lake entered the North Sea. Afsluitdijk, damming off the Zuiderzee, with discharging sluices at two places (Stevinsluizen at Den Oever and Lorentzsluizen at Kornwerderzand). ^ Tockner, K.; Uehlinger, U.; Robinson, C. T.; Siber, R.; Tonolla, D.; Peter, F. D. (2009). "European Rivers". In Lekens, Gene E. Encyclopedia of Inland Waters. 3. Elsevier. pp. 366–377. ISBN 978-0-12-370626-3.